Outdoor fitness parks inspire the community and promote good health, wellness and positivity. Durable made equipment in accessible outdoor spaces provides a free outlet for people of all skill levels to take action to improve themselves while enjoying the community. The Cardio Walker is a self-powdered upright fitness station that simulates running, leaping or cross country skiing, which focuses on improving the lower body, core and heart. Differing from an Elliptical machine the Cardio Walker station features a connected stability rail which helps maintain balance, posture, and stabilizes the core all while managing stride pace. Each workout on this station is able to challenge a wide variety of users providing easy controls for modifying speed, time and the length of stride. 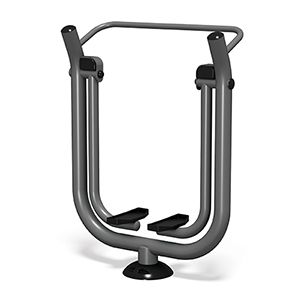 Built to last with powder-coated steel, this outdoor fitness station is an encouraging low impact tool for all ages and skills to improve their physical and mental wellbeing. Strengthens quadriceps, hamstrings, glutes, calves, lower back, and lower abs. Improves cardiovascular fitness & flexibility. Reduces risk of obesity-related diseases. Lowers cholesterol and boosts energy.